At her home and studio, Saar elaborates on her powerfully direct stories, particularly as they pertain to the African American experience. LOS ANGELES — The artist Alison Saar, NA, set a goal for herself long ago: to clearly communicate her ideas and emotions through the power of form. 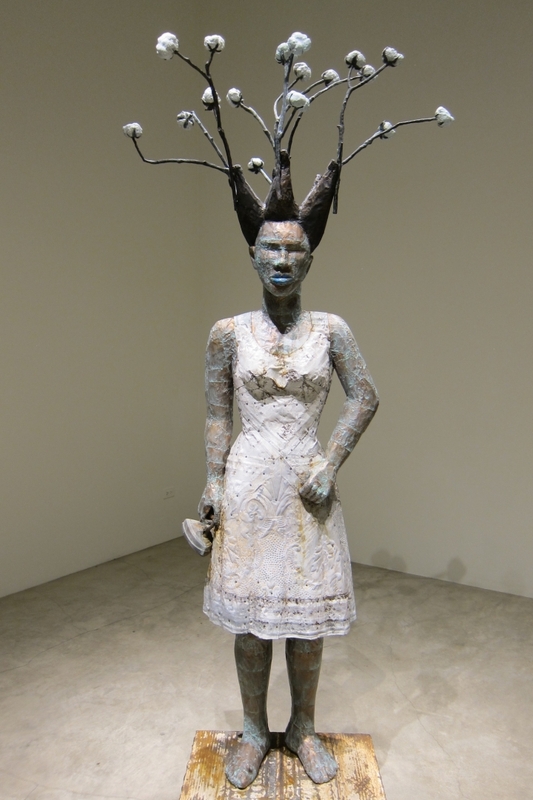 Her sculptures have their own personal vocabulary that speaks in a direct language about history, race, and mythology. If her sculptures are the melodies that capture one’s soul, the narratives behind them are the lyrics. Saar draws from many sources to create her sculpture, graphics, and paintings; she is influenced by the art of ancient Europe, Africa, African American Folk Art, and German Expressionism. Primarily, though, her works tell the stories of the African American experience and these change through time as the times change. Her current exhibition at LA Louver, like her last one there in 2016, is moving and cathartic, addressing the current political climate and how history repeats itself. Although much has changed, Saar conveys how old systems are still in place, impacting the lives of people of color. Alison Saar grew up in a family of artists: her mother is the renown Betye Saar, an African American artist who gained national attention for her work in the 1960s that directly addressed racism and cultural stereotypes. Alison Saar’s sister, Lezley Saar, is a painter and installation artist whose work engages with the myths and fluid conceptions of both biracial and transgender identities. And her father, Richard Saar, was a ceramic artist. 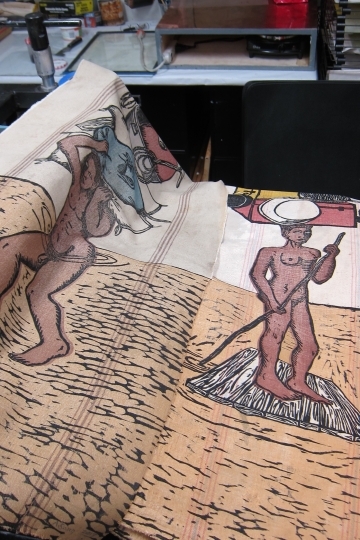 He also had a business for conserving art where Alison Saar worked for many years, intimately learning techniques and styles by restoring works of art ranging from ancient Chinese frescos to African sculpture. Alison Saar was born and raised in Los Angeles. I visited her home and studio in Laurel Canyon, just a few miles from the house she grew up in, where her mother still lives. Her current home is nestled along one of the narrow, serpentine streets that traverse these magical canyons, filled with architectural jewels including several mid-century, case study homes. As I drove up she was casually dressed, having just arrived home from walking her dog. We spoke in her living room, a space filled with her art, including that of friends and family, as well as folk art that she has collected. For her thesis in art history at Scripps College, Saar focused on the work of self-taught African American artists such as Horace Pippin, William Edmondson, Nellie Mae Rowe, Clementine Hunter, Bill Traylor, and others. Their work, which is often spiritual and spoke directly about their life experiences, affected Saar deeply. Ancient European art has also been influential for Saar. She is especially drawn to the Kouros, an ancient Greek sculpture of a young, naked man. “There is something in the power and force of its form. The tension between movement and stillness,” she observed. All of these influences can be felt in her sculptures, which explore the power of form to invest a work with emotional resonance. After Saar graduated from Otis, her husband, Tom Leeser, accepted a job in digital effects in New York City, so they moved into a loft in Chelsea, long before the galleries came. At that time in the early 1980s many people were renovating their spaces in Manhattan — gutting them to make leaner, more modern interiors. Saar was drawn to the tin tiles with designs pressed into them that covered the walls and ceilings of 19th– and early 20th-century buildings. The tin tiles would become a signature element in her work, sheathing the sculptures and adorning the frames of her assemblages. She also salvaged posts and beams from the streets of Manhattan, the found materials giving her works the patina of age, the dilapidated look of time weathering and corroding our world. After living in New York for 15 years and giving birth to her two children, Saar and her family returned to Los Angeles. Saar moves freely and seamlessly from the deeply personal to more political work, dealing with the history of race in America. She has made work that speaks of her experience of becoming a mother, creating narratives about the African deity Yemaja, a mother spirit and patron saint, especially of pregnant women. In her current solo show at LA Louver, Saar addresses the history of slavery in America. The title of the exhibit, Topsy Turvy, is a reference to the character Topsy in Uncle Tom’s Cabin. In the novel, the inhuman treatment that rendered her callous and indifferent to life is transformed through love, leading her to be filled with hope and a desire for good. Saar interprets Topsy as a symbol of defiance and strength. The sculptures stand with various tools of servitude; a sickle in one and a clothing iron in another. One senses that these tools could be turned into weapons, creating a powerful emotional charge to the work. The patina of hammered metal, the tin tiles that Saar has used for years, adds an aura of melancholy pathos to these sculptures. Their tone brings to mind a quote by Zora Neale Hurston, “Grab your broom of anger and drive out the beast of fear.” It is as though these words could have been written about Saar’s work. As one visitor, who was at the exhibition opening at LA Louver from the beginning to the very end, said of Saar’s work, “It tells so many stories, so many histories.” It is this vision that Saar had long ago: To use the power of art to tell stories, and especially ones that matter. Alison Saar: Topsy Turvy continues at LA Louver (45 N Venice Blvd, Venice) through May 12.